Have you always wanted to participate on one of the dinosaur digs? Are you wanting to experience the thrill of discovery of fossil remains ? Do you want to learn the techniques that paleontologists use in exploration and excavation of dinosaurs? If you answer yes to any of these questions, then check out the following sites! Typically, participants pay a share of the expedition costs and prices do vary. Orginally this page was intended for the US and Canada, in the future it will provide information globally. Western Interior Paleontological Society also offers paleontologic expeditions. The Museum of Western Colorado in Grand Junction offers paleontologic expeditions in Colorado also check out Dinamation International Society's Devils Canyon Science and Learning Center in Fruita. The Cincinnati Museum Glenn W Storrs, curator of vertebrate paleontology at the Cincinnati Museum (513-287-7000) has a site for collection of Diplodocus bones. Judith River Dinosaur Institute Five days of dig site instruction and excavation in the Judith River Formation. Pioneer Trails Regional Museum Join PTRM Paleontologists in the field as they collect fossils in the Bowman ND area. Tate Museum. Week-long educational outings in search of fossils in Wyoming. Wyoming Dinosaur Center Dig for a Day with scientists as they discover, collect, and document Jurassic dinosaur fossils. 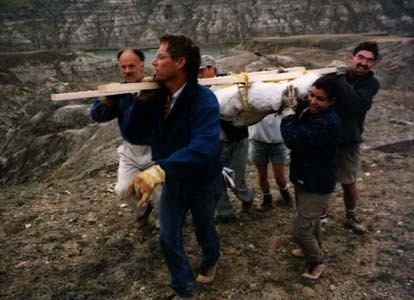 The picture to the left is members of the Royal Tyrrell Museum carrying Euoplocephalus material back to the lab. After the skeleton had been exposed, it was carefully divided and plastered into blocks of a manageable size. From left to right are Dr. Don Brinkman, Dr. Dave Eberth, Brian Matthews, and grad. students, Natalia Rybzynski, Vaia Barkas and Matt Vickaryous.